2016 was a year of mixed achievements. Though theoretically, Pakistan is an independent sovereign democratic state, practically it is tied everywhere with chains. The governance structure of the state is ineffective and manipulated whimsically. The degeneration from a developing to an underdeveloped country is proceeding at a very fast pace. This decline is not attributable to any inherent defects of national power and political economy. It is manmade and artificially articulated to neutralize the many inherent capabilities of Pakistan. This neutralization is based on a premise of a weak and pliant country. Pakistan’s inherent capabilities are deliberately kept underdeveloped. Those that exist are being undermined or maligned in a manner that they do not matter. Pakistan is being strangulated by an apparently benign octopus with nonkinetic ferocity. This is what I called Pakistan’s Present and Future War way back in 2007. This hypothesis was framed by me in 2002 and has not changed since. The war has now entered its most destructive phase. This series is an expose of how deliberate Pakistan’s meltdown is. In typical Kautilya Strategy, the enemies have reached into the womb and consuming from within. The analysis leads to the conclusion that Pakistan is already a dependent state in most elements of the policy. Economy, the engine that drives a state is now the biggest security threat followed by terrorism and non-performing democracy. Direct threat from India is way down the ladder. The economic performance was explained ‘between the lines’ report of the State Bank of Pakistan. Tailored to look least critical and circumvent criticism from IMF, World Bank, and analysts, the central bank pointed to some fundamental structural defects beginning FY2016-17. Though such projections may fool the public and parliamentarians, experts have identified the holes in the argument. The Government is continuously borrowing money from internal and external sources. Therefore, external debt and liabilities (EDL) rose 7.5 per cent to $60.116 billion in 2010-11 as against $55.901 billion in 2009-10, depicting an increase of $4.2 billion, the State Bank of Pakistan (SBP) indicated in its report. 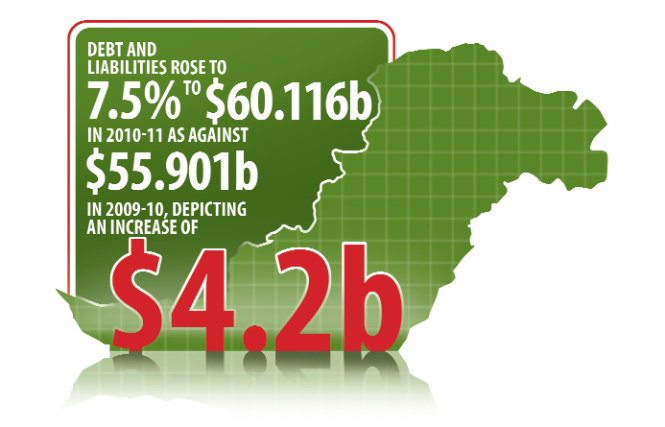 Public debt also increased to $56.315 billion rose from $52.107 billion. The external debt has risen $711 million in the last quarter of 2010-11. The scheduled bank borrowings increase by 23.8 per cent to $239 million, which were $193 billion in June 2010. In the total EDL, the loan from the IMF grew to $8.94 billion from the same period of last years $8.07 billion. After the end of IMF programme Pakistan’s economic managers have suddenly started reflecting unusual economic indices. This trend points towards a freewheeling policy with no checks from regulators and parliament. Trying to make sense of this berserk behaviour, it begins to dawn why the government wants to put all autonomous regulatory mechanisms under the ministries and why it is legislating new economic laws. The suspicion is that many things akin to PROTECTION OF ECONOMIC REFORMS ACT 1992 are in offing. To know how this Act facilitated money laundering and offshore businesses, read Panama the Marshy Trails (Nation on 12 November 2016). The nightmare has just begun to unravel. For instance, the report mentions an inflow of US$ 1.1 billion in FDI inflows from China. This lends credence to official claims that forex reserves are rising, growth increasing and fiscal deficits decreasing. The government is making the nation believe that the economy is resurging, circular debts being contained and energy gap being reduced. We are being made to believe that the new round of investments from CPEC will change the fundamentals of Pakistan’s economy to an export powerhouse in the region. But this is far from true. This single indicator below exposes the hollowness of sustainable economic growth. US$700 million from $1.1 billion inflow from China is a commercial loan from a Chinese Bank at unknown interest rates to cater for the purchase of Chinese plant equipment. It is a commercial borrowing hidden in the head of FDI. Pakistan at some stage will have to repay this and many other loans like this. One explanation given by critics for such fudging is the drying up of coalition support fund, a reimbursement arrangement shown as remittances in the past. Pakistan’s exports and inward remittances have shown a decrease and not made up for the CSF loss. The international relief in oil prices has been squandered and not translated into improved indices like value addition and exports. So to build an illusion of growth, the government has plugged the hole with CPEC. This means that rather than making CPEC a viable engine to development, the government is hell bent on mortgaging Pakistan’s future at least to win next elections. What havoc will such transactions play with structural balances of Pakistan’s economy be anybody’s guess? Already the IMF has warned Pakistan that if the government does not put in place a comprehensive strategy for reforms, investment, exports and growth such arrangement will create exorbitant debt liabilities. Unlike the five years plans of the past, no comprehensive plan exists. Economic management is on day to day basis through tight controls by the ministry of finance. Economic development models never work like this. This is exactly what happened to Latin American countries during the Cold War and is happening to Africa now. It is also happening in Libya, Iraq, and Syria. Subtracting the incidental growth created by inflation and consumption, Pakistan’s actual growth is negative. FBR collection has shrunk. In fact, it cannot even cater to debt liabilities. The agriculture sector, the quickest element of national growth is in negative and neglected. This has impacted exports that are mostly agricultural including value added products (textiles etc). These are also hit by the energy shortages. Large scale manufacturing (LSM) is stagnant. Not a single economic index indicates any effort at sustainability. So it is easy for the government to indulge in tied aid, promote consumerism built on imports (tied trade) accumulate bilateral and multilateral loans, borrow commercially from international and national banks, floats bonds and use up all to pay back liabilities (debt trap), plug deficits and support expenses. The cycle goes on and on. The government borrowed Rs 1079 billion (a turnaround of Rs 1314 billion including paying Rs. 235 billion) from the State Bank of Pakistan during the past six months. This is being dome to cater for budgetary deficits. Once the FDI loans, direct and indirect international and domestic borrowing is combined, it leads to the irresistible conclusion that Pakistan is being led into the Black Hole of a debt trap that will gradually become impossible to navigate. The government is adding public debt at a rate of Rs 288 billion per month (liability of every Pakistani increasing by Rs. 14,400 per month). Thus the total liabilities of every Pakistani as part of per capita segment of the total loans are not in hundreds of thousand per head but in millions. Pakistan’s LSM that contributes to home led sustainability has collapsed. From November 2015 to March 2016 LSM recorded a rising trend at 7.6%. By June 2016 it nosedived to zero. The past figures were fudged to please IMF. The ugly conclusion is that LSM is just the tip of a stagnating economy. These are few but tangible indices indicators. Conspicuously missing is the reflection of the hyped fanfare of CPEC. Military’s efforts in constructing communication highways of CPEC and making Balochistan peaceful are in full gear. But where is the five, ten or twenty-year development plan that shall see Pakistan grow as a self-reliant, export-oriented powerhouse of the region? As of now India is ranked 39th, Sri Lanka 79th and Pakistan a low 122. This single dissection reasserts my oft-repeated assessment that Pakistan is fast moving towards economic insolvency. The situation is beyond a dependency. Pakistan is moving very fast towards a ‘heavy in debt’; discredited; pliant and non-nuclear state. Got it! Pakistanis have the right to be dreamers. But dreams cannot be substituted with delusions. With loans crossing reaching the $75 billion mark, we seriously need to put a stop to this before loans become unpayable and the country defaults. And more vital assets may be under consideration for a mortgage. For decades, Pakistani governments have been taking loans to fulfill local demands and start new projects. As things stand, Pakistan’s foreign debts have currently crossed the $75 billion mark. In recent times, the loan amounts have reached such highs that not even international or local lending institutions are willing to loan money under simple conditions since they want assurances that their investments won’t go in vain. For that reason, Pakistani governments have started putting national assets of extremely high value as guarantees (mortgage) in exchange for more loans or otherwise for Sukuk Bonds. Sukuk bonds are Islamic bonds. They have structured in such a way that investors get returns without infringing any Islamic law (for example, no interest is charged on such investments). Sukuk represents undivided shares in the ownership of tangible assets relating to special investment activity. In other words, the bond issuing authority purchases an asset and the investors get partial ownership and returns. The issuer also has to buy the bond back at par value at a later date. We’ve compiled a list of national assets and the details regarding their mortgage based on official as well as leaked documents in the public domain. The sources have been included in the end. Back in 2013, the government used Jinnah International Airport Karachi as security for the Sukuk bonds and raised Rs. 182 billion based on it. The profits for bonds were to be paid using the income from the airport. 2013 was the first year where the airport was put as collateral to borrow Rs. 182 billion. In December 2015, Rs. 117 billion were borrowed against the Karachi airport. In February 2016, Rs. 116.2 billion were raised by putting the airport on a mortgage. A month later, in March 2016, the government used the airport as the underlying asset to borrow another Rs. 80.4 billion. These amounts were received from local and international institutions and investors. Recently, Pakistan government was ready to put up Sukuk bonds in order to raise $500 million from investors but it was oversubscribed at $2.4 billion. Finally, the government decided to raise $1 billion from foreign investors by mortgaging the Islamabad-Chakwal section of the Islamabad-Lahore (M2) motorway. These bonds are set to mature within 5 years. Back in 2014, the government pledged the Hafizabad-Lahore section of the M2 motorway to raise another $1 billion in terms of Sukuk Bonds with a 5-year maturity period. In June 2014, the government borrowed Rs. 49.5 billion by mortgaging the Faisalabad-Pindi Bhatian Motorway (M3). The news about the above mentioned M2 motorway was also leaked by Rauf Klasra before an official announcement. Back in 2006, the government decided to pledge most of the national highways and some motorways in order to raise Rs. 6 billion. Islamabad-Peshawar Motorway (M-I), Faisalabad-Multan Motorway (M-4), Islamabad-Murree-Muzaffarabad Dual Carriageway (IMDC), Jacobabad Bypass, D.G.Khan-Rajanpur Highway, Okara Bypass and several other toll-yielding projects were set as security. A consortium of banks provided the loan for seven years. With this, the trustees own the motorway, all constructions on it, flyovers and interchanges in the case of late payment. According to leaked documents, Pakistan government has decided to mortgage all PTV assets in the whole country as collateral for more loans. The PTV assets are estimated to be worth in billions of rupees at the very least and the national television also holds great importance as far as national security is concerned. So far there has been no confirmation or denial from the government but considering that these are official documents, the leaks seem authentic. There have been no estimates of how much the government valued these assets for. Similar to the PTV mortgage, leaked documents state that all of Radio Pakistan’s assets in the country will be pledged to get loans. More details have revealed that 61 Radio Pakistan buildings across the country have been valued at just Rs. 72 crore. Experts say that this amount is equivalent to the value of Radio Pakistan’s single building in Islamabad’s Red Zone let alone 61 buildings in premium areas across the country. Estimates price these assets at several times the valued amount. By devaluing such a huge asset, it is the investors who are benefiting the most. Another aspect questioned by the experts is that national radio holds the most importance in times of war and with matters heating up between India and Pakistan, we could lose an important national security asset if the government fails to return the loan on time. Pakistan government has been taking these loans to fill exports gaps, increase foreign exchange reserves, meet budget requirements but more importantly to pay back previous loans. When a government pays back loans by taking, even more, loans, it is usually a recipe for disaster. When commenting on this borrowing spree, local and foreign experts say that Pakistani Finance Minister is leading the country towards a “debt trap”. This is a term experts use to explain such disastrous scenarios. Moving on, this also means that Pakistan cannot pay back its loans at the moment mostly because of the lack of exports and tax collection. When the country cannot pay back loans, putting up national security assets as collateral for the mortgage makes little sense. Just imagine if Pakistan is late on any of the payments, and/or the situation with India worsens and results in a war, this could lead to Pakistan losing these assets to private institutions. Issuing bonds is a good way to borrow money. However, mortgaging most of your vital installations like the biggest airport in the country, the national radio or TV or the central roads as collateral seems like a risky proposition, to say the least. What if some issues occur and profits from these institutions cannot be used to pay back profits on the loans? The government would be in deep trouble if something like this happens. Some analysts also question the use of Islamic Sukuk bonds for budget financing and then linking the returns with treasury bills, citing that it is forbidden and against Shariah laws. However, that is an altogether different debate for another time. We just hope that our government(s), whether federal or provincial, find other means to improve the economy instead of issuing superficial claims based on such huge amounts of loans. With loans crossing reaching the $75 billion mark, we seriously need to put a stop to this before loans become unpayable and the country defaults. This entry was posted on Friday, January 13th, 2017, 12:13 am and is filed under Economic Hitmen, Economic Terrorists of Pakistan, Pakistan Economy. You can follow any responses to this entry through RSS 2.0. Both comments and pings are currently closed.